Earth's magnetic field is in a state of dramatic weakening – and according to new research, this phenomenal disruption is part of a pattern lasting for over 1,000 years. Earth's magnetic field doesn't just give us our north and south poles; it's also what protects us from solar winds and cosmic radiation – but this invisible force field is rapidly weakening, to the point scientists think it could actually flip, with our magnetic poles reversing. The last reversal of the poles towards today's orientation took place 780,000 years ago. Earth's magnetic field serves as a shield against dangerous radiation from space, especially the Sun's charged particle flux. Since 1840, the year systematic measurements began, the global strength of the magnetic field has decayed at a rate of about five percent per century. Since that time, a significant anomaly of reduced magnetic strength has appeared over the South Atlantic: the South Atlantic Anomaly. Within the research community it is a subject of debate whether this anomaly is a sign of an imminent reversal of the Earth's magnetic poles. Based on a reconstruction of the Earth's magnetic field of the past, scientists from the Helmholtz Centre Potsdam – GFZ German Research Centre for Geosciences and the Universities of Iceland, Liverpool, and Nantes now show that the anomaly is probably not a precursor of a switching of the poles. 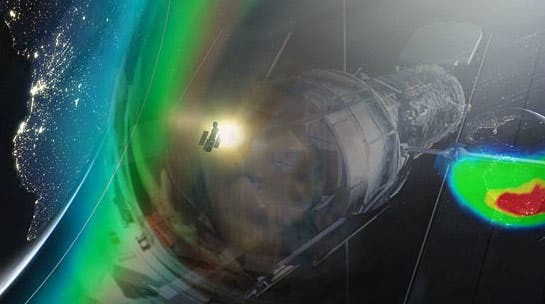 This Hubblecast video tells the story of what happens to the Hubble Space Telescope in the mysterious region known as the South Atlantic Anomaly. When satellites pass through this area they are bombarded with swarms of intensely high energy particles. This can produce 'glitches' in astronomical data, malfunctioning of on-board electronics, and has even shut down unprepared spacecraft for weeks. Within their new study, published in Proceedings of the National Academy of Sciences of the United States of America PNAS, the scientists reconstructed past changes in Earth's magnetic field using paleomagnetic data from sediment cores and volcanic rocks from across the globe. Magnetic minerals in the rocks and sediments "record" the orientation and strength of the Earth's magnetic field at the time of rock formation. 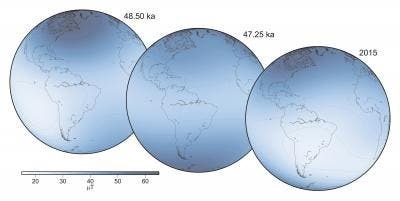 For the time interval of 50,000 to 30,000 years before present the data base is especially good, so that the scientists were able to model the changes of the magnetic field globally. 41,000 years ago, a short-lived reversal of the poles occurred, the so-called Laschamp excursion. During this time, Earth's magnetic field switched polarity for less than one thousand years, with the pole returning to its original polarity. At the beginning of the excursion, the field showed a significantly different pattern of reduced magnetic strength across Earth's surface than today. "Based on our observations of the past 50,000 years we conclude that the South Atlantic Anomaly cannot be interpreted as a sign for the beginning of a reversal of the poles," said Monika Korte, co-author of the study and team leader in the GFZ section on Geomagnetism. "Times of the past that, unlike the beginning of the Laschamp excursion, showed patterns of the magnetic field like today were not followed by a pole reversal. After some time the anomalies disappeared." The scientists can, however, not say how long today's anomaly will persist. It is possible that the strength of the field will further decay for several centuries. The last reversal of the poles towards today's orientation took place 780,000 years ago. It may take thousands of years before the magnetic field reverses again.